Mommy's Kitchen - Recipes From my Texas Kitchen: Cracker Barrel Farm to Table Collection & A Gift Basket Giveaway! & A Gift Basket Giveaway! To say that Cracker Barrel is my favorite restaurant is an understatement. If it's my choice to pick a place to eat you can bet Cracker Barrel will be my choice. Also every year on Mothers Day I head to Cracker Barrel for either Breakfast or Dinner (always a hard choice). I was raised on comfort food, so their menu has all my favorites, Chicken Fried Steak, Chicken & Dumplings, Roast Beef, Pork Chops, Homemade Beef Stew, Breaded Okra, Hash Brown Casserole, Pinto Beans, Southern Green Beans & Bacon, Biscuits & Gravy, Fluffy Pancakes, Country Ham and those famous Fried Apples. It's Home Cooked Heaven! Anytime I head into Cracker Barrel I have the same routine. I sit down, order my meal and while I wait for the food I browse around their Old Country Store. I usually head to the clearance section first and then make my way around the whole store. It's very rare that I leave Cracker Barrel empty handed, because they have such amazing gifts and products. A couple weeks back while visiting Cracker Barrel I got a glimpse of their new Farm to Table Collection. The fresh colors and farm style immediately caught my eye. The new collection includes an exclusive stoneware dining set inspired by summer farm stands, plus other home accents full of farmhouse charm. 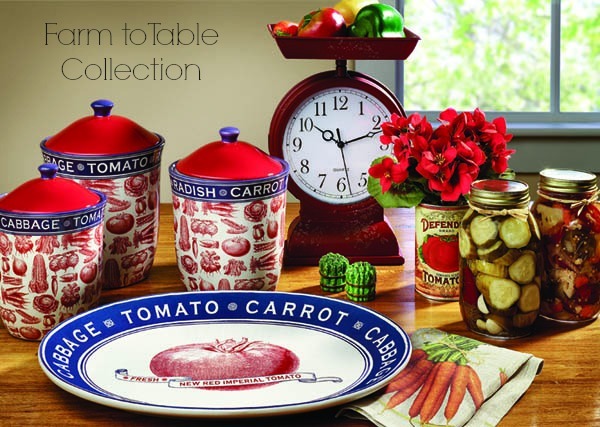 The Farm To Table Collection is available in store as well as online. Cracker Barrel generously sent me a beautiful gift basket filled with a few farm to table goodies to sample. I'm so excited because most of my kitchen decor is from Cracker Barrel. Below are a few of my favorite things I received. I love these Milk Jug Measuring Cups. At first glance it's a decorative Milk Jug, but separate the cups and you have nesting measuring cup set. Each set includes a 1 cup, ½ cup, 1/3 cup and ¼ cup measurements. This is not only decorative, but useful as well. I'm a huge apron fanatic, so I was excited to receive this Kitchen Vegetable Apron to add to my collection. The colors are bright and it has a vegetable pattern scattered throughout the apron. The bottom of the apron is ruffled for additional charm. Red is the color of my kitchen, so this apron fits in perfectly. Also included was this new cookbook titled "Food in Jars" by Marisa McClellan. I'm a huge fan of canning, so this cookbook will come in handy in the next few months. This is a hardback cookbook with beautiful farm inspired photos and lots of great recipes. I plan on making the Meyer Lemon Jelly, Bread and Butter Pickles and I want to try my hand at canning fresh peaches. 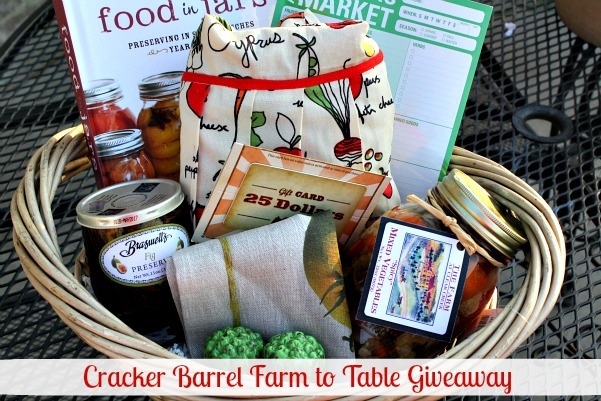 I'm excited to announce that the wonderful folks over at Cracker Barrel are offering one Mommy's Kitchen reader a fabulous basket of Farm to Table goodies too! This Giveaway is now closed. 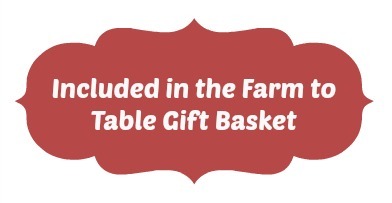 The Winner of the Farm to Table Gift Basket is... Comment #91 Deb Geary! 1) Stop by Cracker Barrels online store and leave a comment on this post telling me which Farm to Table item caught your attention? For me it's the Rooster Inspired Buckets & the Milk Bottle Tea Light Holder. 2) "Like" Cracker Barrels Face Book Page. Come back and leave a separate comment letting me know. Giveaway starts today Tuesday, August 7th, 2013 and ends on Wednesday, August 14th 2013 at Midnight (CST). Contest is open to US Residents only due to shipping charges. If you leave an anonymous comment please include your email address. This way I can contact you in the event that you're the winner. I will randomly pick one winner and that winner will have 48 hours to respond before a new name is chosen. Stay up to date with new retail collections and menu items available at Cracker Barrel on Face book, Pinterest and Twitter. This Giveaway is sponsored by Cracker Barrel. All opinions stated above are 100 % entirely my own. I would like to thank Cracker Barrel for choosing Mommy's Kitchen. I have to say those Garden coffee mugs look like the perfect size for a nice warm cup of coffee in the morning!!! I "liked" Cracker Barrels face book page! Love the stoneware collection and Cracker Barrel! I really liked the 3 piece canister set! sorry it didnt post my name. I was the unknown above. I really like the red and white apron. All the little details make it so cute! I love the red scale clock and the wooden rooster sign. I like the scale clock and canister set. Decorative Milk Bottle Tealight Holder. The Vegetable hand-hooked rug and the vegetable plates are my favorites! Went over and "liked" the Cracker Barrel facebook page! Love the corn cob salt and pepper shakers. Love Cracker Barrel on FB. I love the wooden rooster table sign and the farm house table style lamp.I also liked Cracker barrel on FB. Liked their page who wouldn't. I love the Rooster Inspired Buckets would go great with my country kitchen love everything about Cracker Barrel! I liked Cracker Barrel. In the Farm to Table I like the Corn salt & pepper set & the Garden mugs. I love going to the restaurant & store. Love the cracker barrell Facebook page! I liked cracker barrel fb page! Crackle Barrel is liked on my facebook page. I love the red scale, rug. I love it all. Cant wait to see it in person. I like the Milk Bottle Tealight Holder too. I love Craker Barrel I love the country ham and red eye gravy. I like the nesting measure cups, and the food in a jar. I love that purple apron! So stinkin' cute!! Cracker Barrel is liked on my facebook page. I love everything but the mugs and the serving bowl and platter caught my eye. I LOVED the Food in Jars book. I would love to get the cookbook I just started canning this summer and I can't get enough of it! I wish I would had tried it years ago! I also liked Cracker Barrel! I love anything rooster cuz the first gift hubby gave me was a little rooster sign that said Jo's Kitchen. I love the stackable measuring cups & being Italian, I'm always looking for a good size serving bowl. We live close to a Cracker Barrel & love their comfort foods. I can proudly say, my chicken n' dumplins are almost as good as theirs. Almost. Liked Cracker Barrel's FB page a while ago. The food in jars book looks great to me! I love the Purple Kitchen Apron! We love Cracker Barrel! I also liked Cracker Barrel on Facebook. Garden Coffee Mug set. Perfect for my summer kitchen. I love Cracker Barrel! Going there for breakfast this Friday...Yay! HEAVENs ! I am going to buy the Milk Bottle Tea Light Holder I am thinking! So unique ! I love their site ! Must investigate some more! I "LIKED" CRACKER BARREL TOO!!!! I liked the CB Facebook page. I LOVe the Garden Coffee mugs!!! I liked the CB Facebook page. I like the red scale clock. I went to Cracker Barrels' facebook page and "liked" it. I love the purple apron! I love the milk bottle tealight holders and also the tin cutlery holder. I like Cracker Barrel on Facebook! I LOVE the tomato platter. I think I have to stop by Cracker Barrel now! Thanks for the chance. I love this stuff! Just my style! I liked Cracker Barrel online store; and the thing that caught my attention was Reversible Lodge® Cast Iron Griddle, mostly because I really really want one. During football season, I cook over an open fire both outside and then in my fireplace, and would love to have a griddle to be able to cook more things! I love the red scale clock! 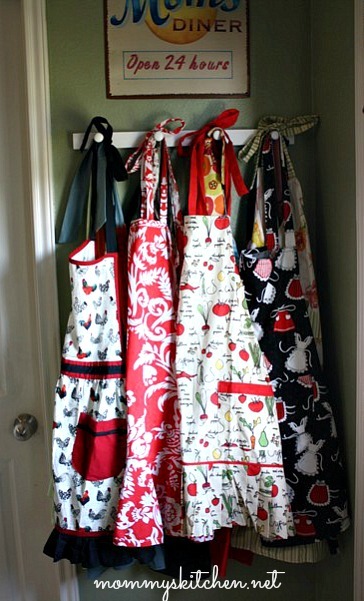 I love all the aprons! 2nd post-I have also "liked" the Cracker Barrel FB page! I loved the Food in Jars Cookbook on the Cracker Barrel site. I've just started canning and try to find all the recipes and information I can. I LOVE the rocking chairs! Always wanted a double one. I also liked cracker barrel on facebook! I was in a Crackle Barrel just a few weeks ago and couldn't keep my eyes off the red scale. It's still my favorite. Thank you for such a wonderful gift opportunity! My favorite was definitely the Wooden Rooster Table Sign!! I have "liked" the Cracker Barrel Facebook page. I love those milk jug measuring cups, but I didn't see them in the online stuff. I'm definitely running by there this weekend and hoping to find them ... just too dang cute! I love the food scale clock!! I liked the cracker barrel fb page!! I love the garden bowl set. They would be great for a yummy bowl of soup. I liked the cracker barrel facebook page. I love, love, love the red scale-clock and the milk bottle teal light holder! We just ate at our local CB and I fell in love with all of their new Farm to Table goodies! I "liked" Cracker Barrel's facebook page! I love the purple apron and the cider jug chimes. I liked Cracker Barrel's facebook page. 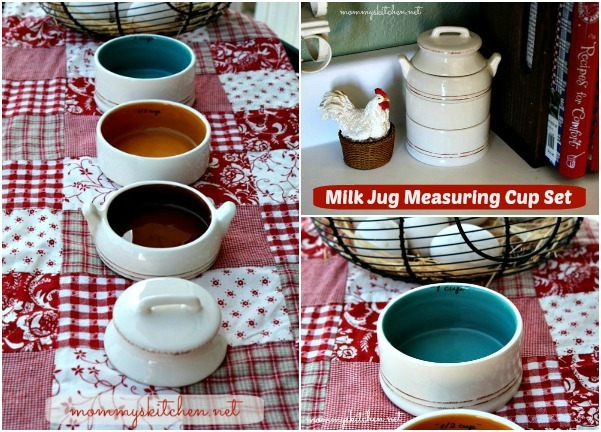 I love the milk jug measuring set! I liked Cracker Barrels on Facebook. I like them in person too. Italian linen napkins..but I love them all! I love it all, but how cute are those corn salt and pepper shakers?! Also "liked" their page on Facebook! I love the milk bottle tealight holder. So cute! I like the Brown Mercury Glass Lantern. I really love the garden coffee mugs!!! I love coffee and i love coffee mugs!! There are so many wonderful things! I love that milk bottle tealight set, it's so sweet! But I loved most everything else, too. What a lovely collection for a country kitchen like ours in our 1893 home! I Like Cracker Barrel on Facebook (and I really do!). Love the garden coffee mugs. Liked on Facebook as well. The food in jars cookbook is my favorite, love the portion control! I liked Cracker Barrel's face book page! I liked cracker barrel on facebook! I like the garden mugs! I like Cracker Barrel on Facebook. 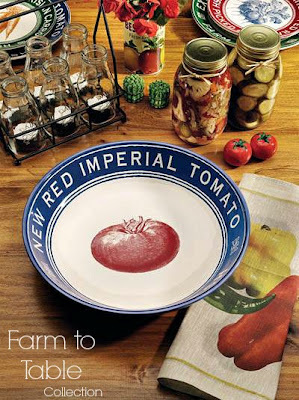 I like the Tomato Serving Bowl. I am a candle fanatic so of course I love the milk jug tealights. I got on facebook and liked cracker barrel....yum! I love the red scale clock. I am already a fan of Cracker Barrell's Facebook page. I love everything at Crakher Barrel-I have such a hard time choosing just one thing-thats like putting a kid in a candy store and saying you are only allowed to pick out one small thing-It's a wonderland to me. I liked the "Food in Jars" canning book. But all of their items are great quality. I love the red scale clock and the apron is a close second! Vegetable Hand Hooked Rug is fun. I loved the "Lodge® Cast Iron Biscuit Pan" and I have allways loved their rocking chairs. I also like theie FB page. I go there at lunch a lot and eat from the kids menu...lots of people don't know but everyone can order from the kids menu....I, too can't leave without checking out everything in the country store! I "like" Cracker Barrel on Facebook ...been a fan of theirs a long time! Really liked the 3 piece canister set, love the red! The Decorative Milk Bottle Tealight holder is my favorite ...I can invision it sitting in the middle of my country kitchen dinette table ! I also liked Cracker Barrel ! I love the milk jug measuring cups. I'm going to need to make a quick stop on my way home to see if they have that at my Cracker Barrel. I love the aprons - so nostalgic. I like the cookbooks as I am collecting cookbooks so far I have something over 250 and still going. I love it all, but if I had to choose one thing, it would be the Tomato Serving Bowl. I love the tin cutlery holder. I liked their face-book page. I like Craker Barrel on FB. 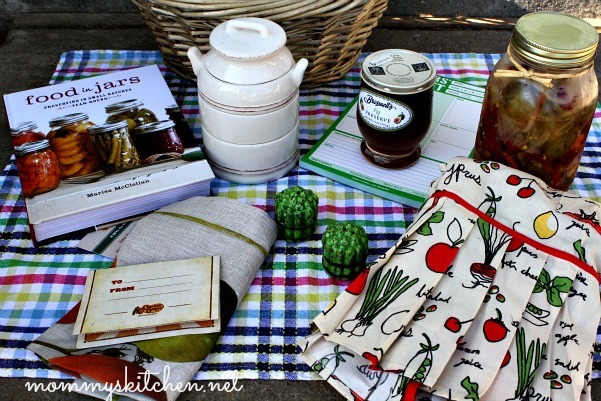 My favorite item that caught my eye is the Food in Jars cookbook. All the book I have are for larger batches. I like the idea of being able to can in SMALL batches. My favorite was either the purple apron,, or the statue of the rooster,, Im a rooster nut..lol.. It would definitely be the Decorative Milk Bottle Tealight Holder... love it!! I love the milk bottle tea light holder, so stinkin cute!! Oh I also liked cracker barrel fb page!! Oh gosh! I love the corn salt & pepper shakers, oh the milk tealight holders and the purple apron! I love it all! I liked the purple apron and the corn salt and pepper shakers. I liked their FB page and darnit, now I want to go eat there! I love the rooster decor and I cook with the cast iron so I always look at that when we go into a Cracker Barrel. There are so many things I love to look at when we go to the Cracker Barrel that it is hard to choose just one thing to like. My favorite Farm to Table Items were the Large Ceramic Rooster Statue and the buckets too. I liked Cracker Barrel on Face Book. I have "liked" Cracker Barrel on Facebook for a long time now :) , just wish there was a "love" button !!! We were in Cracker Barrel the other night and I saw the milk jug measuring cups and fell in love with them. Those are my favorites right now. I think if I looked longer there would be more. I love Cracker Barrel. My favorite item from the collection was the red plaque that talked about roosters crowing and hens delivering lol! I love, love, love that cute farm table lamp and the cutlery holder. There are so many cute items so it was difficult to choose. I also love aprons and have fond memories of my grandma wearing hers everyday. I don't know how I missed "liking" Cracker Barrel on FB before! One of my very favorite places to go and its sooo hard choosing between breakfast and dinner. Love that Red Scale Clock in their new collection! Blessings,, love Your Blog girly!!! Love the purple apron. Chicken and dumplings are my fav at Cracker Barrel, if I'm not having breakfast that is. I liked the Cracker Barrel FB page! I LOVE the purple kitchen apron. Purple is my favorite color and was my mama's too! I really like the tomato bowls and the salad plates. Love the garden coffee mugs!